The first part of this challenge is to say schupfnudeln. Unless you have a German speaking back ground, it’s a little bit of a mouthful. A good mouthful though, let it roll off your tongue and try it out a few times… schupfnudeln, schupf…much like the little pan-fried potato dumplings themselves. Now potatoes in this household are not a huge staple. My kids are probably the only kids on the planet who don’t particularly like them. Me, I can take or leave them. However I did like making these, as I hadn’t heard of them until recently. They are a German potato dumpling, (which are very similar to Italian gnocchi) where you cook your potatoes, pop a couple of eggs in and then add a little flour to the mixture. 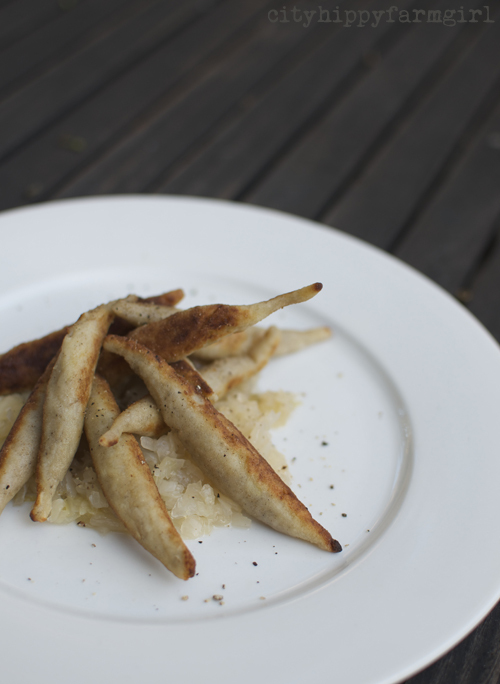 Now the second part of the challenge is to see if you can take a picture of these little pan-fried dumplings served with sauerkraut in a tantalising way. Google images of schupfnudeln and you’ll find a whole lot of beige. They are a bugger to photograph. They make children, pets and chocolate brownie seem like a walk in a photogenic park. Are you game to take on the plated beige? 800g steamed potatoes, with their skin peeled off. Now grate them and put them in a big mixing bowl. Add two eggs, salt and pepper and enough flour to bring the dough together. Knead together on a lightly floured surface, to make a smooth dough and divide off into small pieces. Rolling the edges in a pointed fashion. Pan fry them lightly and serve with sauerkraut. 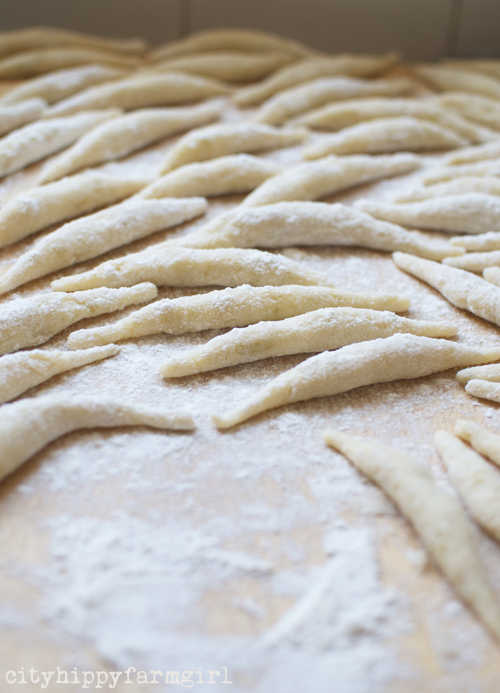 This entry was posted in Making, Creating + Frugal Living and tagged bubenspitzle, dumplings, fingernudeln, Frugal Living, german cuisine, potatoes, schupfnudeln by cityhippyfarmgirl. Bookmark the permalink. Oh you will just have to make some! Did your mum’s look like these ones? I’m so intrigued by them, but would love to try someone else’s to see if I did it right. I love the look of these indeed- yummo! I think you did a great job photographing them! They look wonderful and definitely perfect for frugal Friday! Very frugal that’s for sure. Still monkeys to photograph their good side though! Schupfnudeln, schupfnudeln, schupfnudeln! I don’t know if I am saying this right but I’m having a lot of fun trying. This contrast of hot and cold and different textures sounds like it would be very yum. Was it a lot of work to roll it in to those shapes I wonder. Not that this would help with the color issue, but I wonder if you could add a dollop of sour cream? Hehe I must admit I wouldn’t know how to pronounce that. And I did learn German at school (learn being a very loose definition of the word). These look magnificent! I think you took a pretty good photo. The colour on the schupfnudeln definitely helped.